The key to relaying (digi-ing) the signal from the moving station to the end-user we use digital-repeaters (digi-peaters) and iGates which links the radio based position report to web-based servers. Mag Mount or Portable Antenna Tower when used in an event. Base Antenna when used at its “normal” locations. The kit allows for receive only iGate mode or up to 50w RF digi, and any combination. 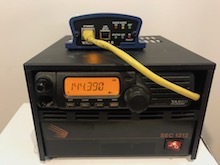 By connecting the unit to ethernet internet or a mobile Cell Router all APRS data is available on portable devices like an iPad. The WX3in1 TNC is programmed with automated “profiles”. When a GPS is connected, the unit switches from “static” predefined beacon location to “Event Mode” message and location. Although not used in my configuration, It also has a Beta Smart Beacon Mode to be used as a tracker. I use this Beta version in my car for APRS beaconing.